Newborn babies sleep very well when swaddled. The pressure of the fabric against their muscles and bones help them sense their bodies more clearly and they feel more secure as a result. This physical sensation created by the cloth fabric replicates the experience of being in the womb where baby feels pressure from the water. Parents learn to swaddle baby in order to quiet baby for naps and for sleeping through the night. Soon, they ask “When do I stop swaddling baby?” Many parents stop swaddling baby by the age of two to three months. As babies begin to learn to feel their limbs stretch and learn the early motor skill of rolling onto their tummy, the swaddling can be restrictive and potentially dangerous. Transitioning baby from swaddling to no swaddling is not so easy sometimes. The key is to create a similar physical sensation for them of the pressure on their body which makes them feel secure without the restriction of the fabric wound around them. This concept is the idea behind a “sleepsuit.” The thickness of the fabric and the snug fit help baby feel secure so she can sleep through the night. A favorite sleepsuit is Baby Merlin’s Magic Sleepsuit. Designed to create a “cozy, calming, and safe sleep environment,” the Magic Sleepsuit is an excellent transition out of the swaddling. Developed by a pediatric physical therapist who is also a mother of four, the idea behind the magic sleepsuit was how to prolong the duration and quality of a baby’s sleep. One of the most important events in the development of a baby is sleep. With a good night of sleep on a daily basis they have more energy for their motor skill development. 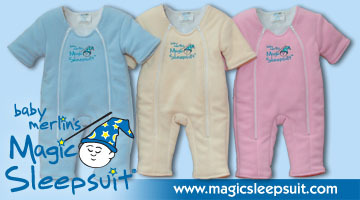 Next, we would like Magic Merlin to create a sleepsuit for tired mommies. One of the important mini baby milestones is achieved when baby can be comfortable and quiet when put down on the floor or in his crib for baby play or sleep. Often in the first three months when a parent puts the baby down he starts crying. Sometimes the parent says, “He only goes to sleep when I hold him.” This may be true, but if the pattern continues in a few months he will be quite heavy and the parent may develop back problems. Parents can learn that they are not limited to only two choices: 1.) holding baby while he falls asleep, or 2.) putting baby down and then listening to his cries. A third option exists. That option is to learn parenting tips on how to teach baby to be comfortable on the floor or in his crib without being held in mom or dad’s arms. Learning to be comfortable on his own is an important development of a baby and is essential for motor skill development. Baby benefits from learning to be content on the floor where he will take the time to explore how his body moves and ultimately attain a few motor milestones. Often baby may be set down on the floor or in the crib rather abruptly. For some babies this may OK, but for some it is not. It feels a bit quick and harsh. These babies really like to be held. They feel they contact of mother’s arms so clearly because the sense of touch is one of the most developed senses at birth. For these babies it helps to set them down slowly and keep your hands in contact with them even though you have put them down. Wait awhile and then remove one hand slowly. Wait again and then slowly remove the other hand. 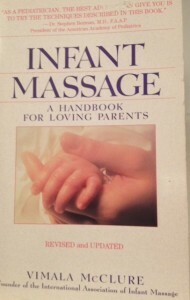 Before removing your hands from baby, talk to him. As you remove the contact of your hands establish a clearer connection through your voice. This is using another one of the five senses to establish a sense of security for baby. A newborn clearly feels the security of his parent when he feels through his skin that he is being held. As his senses develop he can also feel secure when he hears his parent talk. Towards the end of his first year he will know his parent is near when he sees her in the room. Speak to him in a reassuring and soothing voice as you tell him “I am here. You are OK. Everything is OK. It is time to sleep/play now.” Try singing a lullabuy to him such as ‘Twinkle, Twinkle, Little Star.” If you sing the same lullabuy regularly the familiarity will feel soothing to him. Recognize that baby is learning to be comfortable without the presence of your immediate touch. Learning is a process that takes time and repetition. Try these tips for new parents each day and see if there is an expansion in the amount of time that baby can be on his own comfortably in his crib or in floor time. After two weeks notice if you see some improvement. Always consult your doctor if you have a concern. What is colic? Colic is a term used to described babies who cry loud and for long periods of time with no explanation. Often their faces are twisted as if they are in pain. Parents think they may have gas and a trip to the doctor reveals everything is normal, yet baby continues to spend a large portion of daily awake time crying at the top of her lungs. Parents often feel at a loss as to what to do for these babies. Dr. Harvey Karp, a respected pediatrician, researched this dilemna and began working with parents of babies with colic. The result is his book The Happiest Baby On The Block. The Happiest Baby On The Block addresses the question “How Can I Calm My Baby?” by looking at the top five actions parents have taken across cultures over thousands of years. Now a national bestseller, Dr. Karp’s book presents “the 5 S’s”: Swaddling, Side Position, Shhh Sound, Swinging, and Sucking.” Dr. Karp’s theory is that babies respond to the 5 S’s when used in combination because they provide an experience for baby that closely resembles the experience of the womb. Soon, with these techniques, even the fussiest baby learns to be calm. Dr. Karp presents the “5 S’s” in a simple manner so parents can try them at home and quiet baby’s cries. 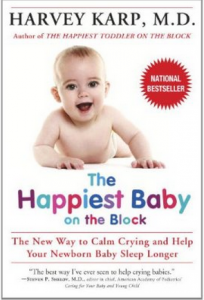 The Happiest Baby On The Block: by Harvey Karp, M.D. (New York: Bantam Books, 2002). The technique of securely wrapping a blanket around baby to keep her arms and legs secure is called swaddling. The blanket is folded in a precise way to be rather snug and keep the arms and legs of a newborn baby from flailing around. The Mayo Clinic website demonstrates one technique for swaddling a newborn. This often is calming to the baby. Sometimes babies are swaddled to keep them warm or to transport them more easily. Mothers around the world have swaddled babies for these very same reasons for thousands of years. Just think of the images you have seen of babies swaddled and put into a papoose which is carried on the mother’s back in Native American tribes or of baby Jesus lying in the manager. One of the most popular reasons for swaddling babies is to quiet their crying. When nothing else seems to work, swaddling is often helpful in quieting a crying baby. Dr. Harvey Karp, pediatrician and author of The Happiest Baby on the Block, demonstrates the swaddling technique in the above video from thehappiestbaby’s youtube channel. Dr. Karp teaches that swaddling a newborn is one of the key elements to inducing a more calm and quiet state. Some babies are swaddled just for sleeping at nighttime so they do not startle themselves as they move. Newborns sometimes startle themselves when they move an arm or a leg. They have been in a watery environment in the womb and the sensation of ones body moving in water is much different than when moving out of the water. When in water there is more pressure against our limbs. They have not yet developed much muscle control of their limbs. Swaddling keeps them from flailing their limbs and provides a clear feeling of their body because of the snug wrap of the blanket. The development of proprioception is very important for motor skill development during baby’s first year. Because baby’s movements are sometimes sudden and unexpected at this early age the swaddling also keeps her from falling out of mommy’s arms. It is important not to swaddle too tightly as well, which will be discussed in a future post. When you ask ‘Why swaddle?” just remember the benefits listed below. The “Wisdom” series presents observations spoken by experienced grandmothers that should be heard by all mothers. “I always put my baby down for a nap at the same time everyday in the playpen with a soft book,” firmly stated my friend who is a mother of four, grandmother of nine, and great-grandmother of one. In our discussions about babies over the last couple of years, I think she emphasized this statement at least fifty times. Her point was always the same: babies need routine and a space of their own to unwind and eventually nap. She insisted that babies get used to the cues of being put in a playpen and handed a soft book which signal “nap time.” She was fortunate that it worked so well for each of her four children. She discussed the importance of allowing the baby some time to quiet himself with a soft book and ease himself to sleep. Some babies can only fall asleep when held, and when they get bigger and heavier this is very difficult for the mother. It is valuable to teach baby to ease into a nap while in his own protected space where the distractions are minimized and the surroundings are familiar. Of course, not all babies will adapt to this method, but it is worth trying. If it works, it becomes a very healthy ritual for both the mother and the baby.